GREENFIELD STEIN & SENIOR, LLP, founded approximately seventy-five years ago, has always placed great emphasis on providing its clients with both quality legal advice and a high degree of personal service. 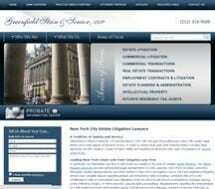 In addition to providing services in traditional areas of practice, such as commercial litigation, commercial transactions, corporate, real estate, and estate planning and administration, we are perhaps the only law firm in New York City with a department devoted exclusively to probate, trust and estate litigation. The collective expertise of our estate litigators has touched upon virtually every aspect of contested trust and estate matters. The guiding rationale in the firm's practice is the traditional, highly personalized, lawyer-client relationship, as opposed to institutionalized relationships. Excellence in legal representation is the foundation supporting the legal services provided by Greenfield Stein & Senior, LLP. We seek to tie the valued traditions of our past to the complex legal demands of today's legal environment. At GS&S, we believe that in order to best represent our clients, we must learn about their individual needs and concerns.